A Refurbished Corner Joint Asks "Where Y'Acht?" It’s normal to find a yacht down a dead end street because they’re typically perched at the water’s edge. The Mid-City Yacht Club sits along an intersection of two dead end streets, but it is not typical. In fact, it’s not even a yacht club. 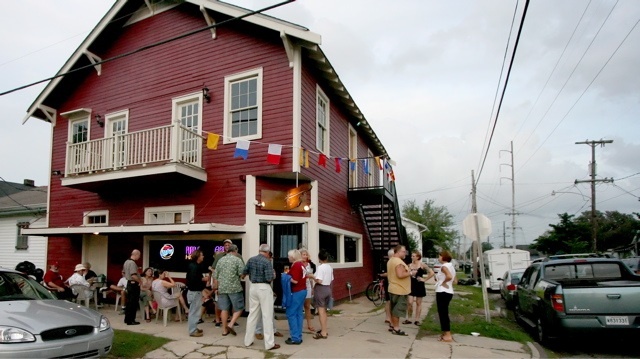 Rather, the Mid-City Yacht Club is a neighborhood bar and a post-Katrina creation through and through. It opened during the summer of 2007, and its name is a whistling-past-the-graveyard reference to the levee failures that temporarily made its address waterfront property. More than that, though, the Yacht Club is an ongoing act of recycling and restoration, and one that’s in tune with the themes of renewal and civic pride ringing through its neighborhood in these post-flood years. Today, you can feel that spirit in the diverse mix of patrons who track down this out-of-the-way watering hole and contribute to its convivial air. It’s manifest in the many events the club sponsors at the adjacent St. Patrick Park, now nicely renovated and home to free movie nights (including one this Saturday). And you can even see it in the luminous and intricate woodwork covering the bar’s walls, which has its own Katrina story. The property has had a long history as a bar. Before Katrina, it was a joint known as Extra Innings, but in recent history it was rarely ever open. There are stories about bachelor parties renting it out for blowout bashes, though they are the kinds of stories no one wants to attribute. Mostly, the place was shuttered, including all those times when Jeremy and M.J. Sauer really wished it weren’t. The young married couple was part of an early pre-Katrina league of adult kickball teams that played directly across the street at St. Patrick Park, then a rundown urban patch. Dozens of thirsty kickball players would look longingly at the Extra Innings door, wondering why the place was never open before they piled into pickups for beer and bathroom runs to bars down the street. Ben and Stefanie Markey got a hold of the property after Katrina and invited the Sauers to join them as business partners. Together, they transformed the once-dingy, practically mothballed Extra Innings barroom into a gallery of newly refinished cypress and oak. They used warped floorboards from the Sauers’ flooded Mid-City home to line the Yacht Club’s ceiling and bar top. They pulled century-old doors from a debris pile and repurposed them as wainscoting around the room. Much of the other woodwork is a patchwork of pieces similarly retrieved and reclaimed from the trash heaps and Dumpsters that lined the city’s streets for so long after the disaster. The result is beautiful, but the building still sits at the intersection of South St. Patrick and Baudin streets, which each dead-end into a tall, blank interstate sound barrier a few blocks away. 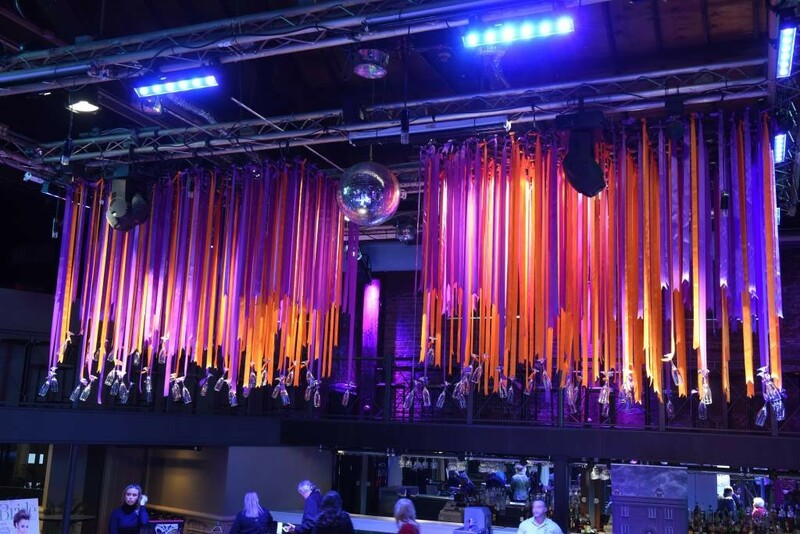 The location is not exactly high-visibility, and, though some people might stumble out from the bar, few people ever stumble upon it. So the owners’ answer has been to play up every opportunity to draw a crowd and build a following. There are pool teams and dart leagues, video game tournaments and an impressive bank of flat-screen televisions to watch games. But the Mid-City Yacht Club’s greatest promotional asset sits right across the street. St. Patrick Park is back in a big way, with adult softball games held each weeknight and a hugely increased roster of kickball teams playing there on Sunday afternoons. The Yacht Club now fulfills the role Extra Innings should have played, slaking the thirsts of these many teams that chase good times as much as they do sporting glory. The Yacht Club produces a monthly series of family-friendly movie nights screened outdoors at the park beginning 30 minutes after sunset (or around 8:30 p.m. this time of year). This Saturday, Sept. 30, the film is Grease and the nearby Ruby Slipper Café will be on hand serving apple-braised pulled pork sandwiches and desserts. The Mid-City Yacht Club offers drink specials during the movies, including handy buckets of beers. Bring a blanket or outdoor chairs. The event is free and open to all ages. The last outdoor movie of the season will be on Oct. 24, when the 1980s classic The Breakfast Club will be shown as a tribute to its recently deceased director, John Hughes.